'Stonewall' was built by Lucien Arman Brothers in France in 1863-64 for the Confederate States Government. However, the French authorities refused to permit her delivery, following strong protests by American Ministers, Dayton and Bigelow. The vessel was eventually sold to Denmark via a Swedish intermediary, for use in the Schleswig-Holstein War. Because of delays, shortcomings in her design and the fact that due to prolonged negotiations over price, she could not be delivered before the sudden termination of the war, the Danes refused acceptance of the ram. Left facing a substantial loss, her builder then secretly re-sold her to the Confederates. The 'Stonewall' was in effect one of two ironclads ordered and built in Europe for Confederate service toward the end of the Civil War. Named after Lee's inspiring general, Stonewall Jackson, the ship was built at Bordeaux, ostensibly for the Egyptian Navy. Temporarily given the name 'Sphinx', she was the subject of intense Union pressure and it was only through a complex chain of events, the 'Stonewall' was finally ‘delivered’ into the hands of Confederate Navy representatives in October 1864. The CSS Stonewall was one of a pair of identical vessels. Her sister ship, code named 'Cheops' was late sold to the Prussian Navy as the 'Prinz Adalbert', after the brother of Wilhelm I. Nicknamed ‘The Lame’, the poorly constructed sister ship served just under five years without achieving any notable service. With a badly rotting hull, the 'Adalbert' was decommissioned in 1871 and scrapped some years later. A 1390-ton ram, 'Stonewall' fared better. Constructed of composite wood-and-iron, her armour extended a full 5 feet below the waterline (1.5 m). Additionally, the hull was copper-sheathed and sported a plough ram, highly visible in all existing photographs. This exaggerated proboscis was a style much in vogue with French design at the time. The ram however induced the vessel to handle clumsily when traveling at speed. Powered by the two, four-bladed, 12-foot screws protruding from large fairings, the Stonewall was redesigned to accommodate twin rudders; and in clam waters, steered to perfection enjoying a very tight turning circle. Topside, she boasted several armoured mountings in the waist of the ship and two, fixed armoured turrets containing muzzle-loading pivot guns that could be pointed out of any of several gun ports. The bow turret was roughly circular, extending almost to the furthest point of the deck and contained a single 10" 300-pounder. The aft turret was more oval in shape and this allowed for two 6.4" guns, one per side. Folding bulwarks also enabled gunners a wide arc of fire over the quarters, beam, and forward. The initial contract with the French builders ‘Lucien Arman’ was for two armoured rams; but with the French authorities finally bowing to Federal pressure, both were offered to the Danish government through a Swedish intermediary. The first vessel, now renamed 'Staerkodder', was due to be complete on June 10th 1864 at an agreed price of 800,000 Danish rigsdaler, to be paid on delivery. Unfortunately it soon became clear the delivery would not be made on time and by 1863, with work almost complete, Lt. Captain Schoeheyder of the Danish Naval authorities reported the vessel would in fact be too heavy; and recommended the order should be cancelled. Almost immediately, the French builders countered; but eventually agreed to fit new, lighter armour plate which would suit the ship’s design better. As a result, the 'Staerkodder' was moved to dry-dock for the work to be done. By end September the ship was back in the water and the French, keen to have it formally accepted by the Danish agent. Negotiations on a reduction on price demanded by Denmark soon became bogged down in the detail; and the overlap was now threatening the financial viability of the French shipyard itself. After almost a year of fruitless offers and demands from both sides and, in an attempt to salvage something from the deal, the French yard covertly approached the confederacy again through their agent, James Bulloch in England, offering to sell him their ship. Bulloch at this time was also being closely observed by the Federal and British authorities and had to refuse. Nevertheless, his counterpart in Paris was keen to accept and a secret deal was agreed in principle. Within days a Confederate crew was being assembled to sail their new acquisition; but the twist and turns of this story have not yet been played out. Manned by a Danish crew, the 'Staerkodder' had previously left Bordeaux for a shakedown cruise on June 21st 1864. The crew tested the vessel unaware negotiations had broken down between the two countries, or that discussions were already on-going between the Confederacy and Lucien Arman Brothers. Intense haggling over the final price and a disagreement over compensation from Lucien Arman for late delivery, led to the Danish deal finally collapsing on October 30th, but the Danish government still refused to relinquish the vessel, claiming confusion in regards to the negotiations, still remained unresolved. On January 5th 1865, the vessel took on a number of its formal, confederate crew at Copenhagen under the command of Captain T.J. Page (Right) and was re-commissioned at sea as CSS Stonewall. There is conflicting evidence on the actual 'command' of the vessel and informed sources do state Danish Captain G.L Moeller was actually 'Captain' - with Page travelling as a passenger? Witnesses reports also indicate the Danish ensign was flying throughout this period which would indicate the latter's captaincy; but confederate captains did receive new instructions on flying foreign ensigns after the sinking of the Alabama. Nonetheless, a storm in the sound between Denmark and Sweden, forced the 'Captain' to return his new command to Elsinor in Denmark. Once more attempt was made to take the ship to sea and once more she had to seek shelter, only this time in Kristiansand, southern Norway. A week later, on January 14th, the CSS Stonewall finally sailed to Quiberon Bay off the French island of Houat, taking on supplies and additional crew whilst in French waters before sailing for Madeira, Azores. 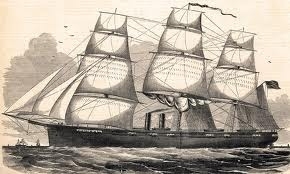 Forced back to the port of Ferrol in Spain* by another Atlantic storm, it was not until March 1865 she sailed again, only to be confronted and followed by the USS Niagara and USS Sacramento before seeking refuge in Lisbon harbour. Due to an incident there (See following article), both these warships were delayed for an additional twenty-four hours by Portugese authorities, allowing the 'Stonewall' to put to sea unscathed on March 28th. The Confederate ironclad was now free to cross the Atlantic, reaching Havana, Cuba, in May. By the time she arrived, the Civil War had ended and Captain Page was forced to relinquish his command to the Spanish Authorities who promptly began negotiations to turn the 'Stonewall' over to the U.S. government. Thus, the deadliest vessel in the Confederate navy surrendered without ever firing a shot in anger. The 'Stonewall's' military career however, was only beginning. She spent some months anchored in the Potomac and being examined enviously by her captors. In 1868 she was sold to the Shogunate of Japan, then in its waning days of power and fighting to retain power against the forces of the Meiji Emperor. With the outbreak of the Boshin War (the Japanese Civil War of 1868-71), shipments to the Shogunate were placed on hold, including the 'Stonewall', despite $30,000 US having already been paid for the ship. When the Mikado's forces prevailed in 1869, she was finally delivered to his government on payment of the remaining $10,000 instalment. Under the name 'Kôtetsu', she took part in the civil war then raging in Japan, playing an important role in the naval battle of Hakodate in June 1869. In 1871, after the victory of the Imperial cause, she was renamed 'Azuma', remaining part of Japan's combat fleet until January 1888, when she was reduced to harbour service as an accommodation hulk. SIR: I take up the relation of what has been done in the case of the rebel ram Stonewall where it was left by my No. 164, of 8th instant. On that day in the morning I sent to Mr. Bigelow the telegram marked No. 16, enclosed in dispatch No. 164, informing him that the Stonewall is the same ship which was called Staerkodder at Bordeaux and Olinde in the Bay of Qniberon, and that she was manned by the old crew of the pirate Florida. In the afternoon I received a telegram from Mr. Harvey at Lisbon, saying that the Sacramento had entered that port and asking for infor-mation. This telegram was also forwarded with dispatch No. 164. I replied immediately in telegram No. 1 of this series, enclosed, giving the information sought, and urged Mr. Harvey to send the Sacramento along promptly. The enclosed letter from Mr. Eggleston, dated the 5th and mailed the 7th instant at Cadiz, was also received and will arrest your attention. What Mr. Harvey wanted of the Sacramento at Lisbon I can not imagine. It seems that soon after he received advice from me on the morning of the 4th instant (via enclosure No. 3 of dispatch No. 162, February 4) of the presence of a rebel corsair at Coruna he sent a request to the consul at Cadiz to send the Sacramento to Lisbon. The vessel was already off for Coruna under the advice sent on the 4th by myself to Cadiz. Unless that ship has been put under the special orders or direction of Mr. Harvey by the proper Department at Washington, I can not but regret the chance which sent her in at Lisbon. Had she kept on her course she would have reached Coruna at about the same time as the Niagara, which latter may need her cooperation. The Sacramento has been lying idle for about two mouths at Cadiz, and might have been supposed to have had time to put her engines in working order. I have been unwilling to give credence to reports which have reached me ot much improper, if not positively disloyal, language used by some officers of this ship in the cafes and public houses at Cadiz. It recurs to me now, however, and you will have recently seen a gentleman who will, I have no doubt, confirm to you what he also said to me. I trust the delay of the Sacramento can be satisfactorily explained to the Navy Department, but happening in connection with these antecedents, it has made me fear that the heart of that ship is not in the work she has to do. The confusion complained of by Mr. Eggleston would be avoided by our heads of legation confirming their consular instructions to the consuls within their own jurisdiction, except perhaps in some rare cases of emergency, when what is said to the consuls should also be immediately reported to the legation on which they depend. In this instance Mr. Harvey received his own information from me, and might have supposed I should not omit to transmit to Cadiz what seemed most proper, according to the facts of the case as known here. Besides, Mr. Harvey is no nearer Cadiz than I am by telegraph, and I have the impression that his telegram must come Iirst to Madrid, to be sent hence to Cadiz for lack of a direct line between those ports. I received also a communication from Mr. Bigelow at Paris, dated 5th instant, giving me important information, to which I replied in the evening of this day, and beg to call your special notice to the copies of these documents, which go enclosed. My own letter, February 8, was the exact statement of the state of this business at the time it was writ- ten, as well as an expression of my own idea of what the Government of France was called upon to do in view of the facts as reported to this legation. I had, in fact, seen Mr. Banuelos the same afternoon, and had received from him the statement that he had shown your dispatch No. 6, of February 4, 1862, to Mr. Benavides, who had found it excellent; that the draft of a note that I had also left with him the day before was very good and entirely acceptable; that it was decided there should be no repairs on the Stonewall, but the Spanish Government could not undertake to arrest her definitively in their port, first, because they had not the material power to do it, and, second, because they did not think they had a right to do it. If they let her go away in precisely the same condition in which she was when she entered the Spanish jurisdiction, they were not responsible for anything this ship might do afterwards. This is what they would do. He would send me back my draft of a note, which I might sign under the same date as the one it was to replace, and withdrawing the latter, the whole matter would be arranged. I confess that having obtained thus much (apparently) I did not feel disposed to press the extreme point of definitive detention of this ship by the direct exercise of the authority of the Spanish Government. I had put it into my note of the 5th instant in order to cover the whole ground which my Government might wish to occupy, in case this question should not be resolved to my satisfaction. But I had the consuls report that the Stonewall could not sail, in point of fact, unless the repairs were made, and I confess I would have dropped that point of theoretical right and contented myself with the practical result of no repairs if the Spanish Government had itself fulfilled what I was that afternoon led to expect. On the 9th February I sent to the consular agent at Ferrol the telegram No. 2, in which I had authorized him to employ what people he might need to watch the ram and see that she made no repairs; that she took no coals, nor provisions and water, except what might be necessary to keep her crew from day to day, etc., ordering him to do all in good accord with the authorities of the port and announcing a letter of credit by mail to cover the expenses of this service. You will find also a copy of a written instruction to the same consular agent enclosing the promised letter of credit from a banking house in this city, another to this banking house soliciting this credit, and another to the consular agent at Coruna containing instructions and authorizing him also to expend the money he might need to fulfill them, making myself responsible. I called also at the French embassy, but did not find the ambassador. Afterwards I wrote him the confidential note of which a copy goes enclosed, and which becomes interesting now as a frank and unguarded statement made at the time of the verbal understanding arrived at with the Spanish Government of my fears that the ram would leave without his repairs in spite of the report of his unseaworthiness, and the effort I was making to get some aid from Mr. Mercier to detain her, considering the definitive refusal of the repairs as a point already settled. On the morning of the 10th instant I saw Mr. Mercier, and he told me that he had seen Mr. Benavides and that the latter had told him that they would not repair the ram, but that there was no force at Ferrol capable of stopping her if she chose to go, and they could not detain her. I am forced to close here to save the mail, enclosing copy of my protest, night of 9th instant, to be explained in next dispatch. Dimensions: 187' (OA) x 32'9" x 14'4" Displacement: 1,390 tons. Armament: (1) 10" 300-pdr Garnard RML; (2) Armstrong 6.4" 70-pdr RML. Armor: 5"/3.5" belt; 4.75" gunhouses. Propulsion: (4) coal-fired boilers, trunked 2 and 2; (2) 2-cyl Mazeline horizontal direct-acting engines developing 1,200 IHP, shafted to twin screw. Sail rig: Brig - 2,428 sf of sail. Steering: Twin rudders hinged to skegs. Maximum speed: 10 kts. Crew: 135. I am indebted to Bertil Haggman LL.M., author and member of the SCV Europe Camp 1612 for information which made this article possible. The English Channel off Cherbourg in June 1864 was not the only place in Europe that heard artillery fire related to the distant American 'Civil War'. Heavy guns were fired in Lisbon Harbour, Portugal against two, US Navy frigates almost a year later during a little known incident which was conveniently forgotten. It was in fact the only time guns in Europe opened fire against American ships during the War-between-the-States. Certainly, it was not a deliberate, Portuguese act of aggression; but did involve a volley of coastal artillery being discharged. So what happened exactly? Nineteenth century International Law demanded belligerent navies maintain a 24-hour delay for any warship in a neutral port intending to follow the departure of an enemy ship. These enforced delays avoided the possibility of engagements in neutral territorial waters (The CSS Alabama often benefited from that during her time at sea). On March 28th 1865, the Confederate ironclad ram CSS Stonewall left Lisbon harbour to cross the Atlantic. Two Federal steam frigates, the USS Niagara and USS Sacramento had arrived in Lisbon soon after the Stonewall; and Portuguese authorities detected one, the USS Niagara was shifting her berth. She was promptly fired upon by the batteries of Fort Belem (See illustration above) in the firm belief there was an intention to follow the CSS Stonewall to sea, in contravention of the international agreement. The question was; did the Portuguese react so precipitously due to some previous bad experiences with the Federal Government’s attitude to international maritime law, or was this a genuine case of over-reaction? Lisbon authorities were very aware of the diplomatic incident caused by the capture of the CSS Florida in Bahia harbour, in Brazil after the USS Wachusset penetrated that neutral port on the night of October 7th 864, boarded the Florida by surprise, then removing it as an illegal prize to U.S. territory. After Brazilian protests, Lincoln acknowledged international law rules had been broken; but mysteriously the Florida was sunk at Hampton Roads before she could be released. Portugal and Brazil are sister nations and obviously, the Portuguese were less than enamoured to see another violation taking place by the Union in their (Lisbon) home waters! In the event, the USS Niagara (See engraving left) received no damage but the artillery action forced the Union ships to stay in port until next morning, much to the advantage of the recently departed Confederate vessel. After the War was over, the US Secretary of the Navy assured the Portuguese authorities there had been ‘no intention’ of leaving Lisbon secretly or in contravention of the treaty and Portugal then offered a muted apology for ‘over-reacting’. Neither country had anything to gain from continuing diplomatic rifts so the matter was quickly forgotten and laid to rest. With our additional thanks to Raphael Waldburg, SCV Europe Camp 1612, member of the 290 Foundation (BVI) Inc., who submitted the original text for this article. Now - why not make the model? Check the files below!